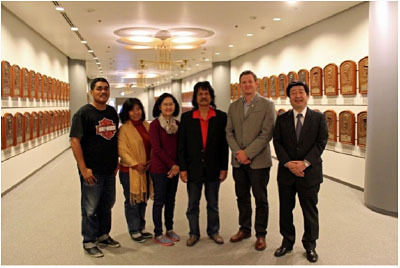 Tokyo: CEO Ryan Flynn of Baseball New Zealand and President Syahir Nawier and his colleagues of Indonesian Baseball & Softball Federation were the honored guests of the Baseball Hall of Fame and Museum in Tokyo on March 26. Ryan Flynn attended a press conference held in Tokyo on March 25 to announce acquisition Team Japan’s 2004 Olympic bronze medalist Naoyuki Shimizu by Baseball New Zealand to work full-time in the development/management of its National Team program. (See an article “No. 28 New Zealand boosts National Team program, ..” by IBAF) Shimizu revealed his plans to help promote baseball in New Zealand, particularly among young generation, and expressed his strong desire to reinstate baseball and softball in the 2020 Tokyo Olympics. Flynn endorsed comments by Shimizu and commented that New Zealand should be one of those countries with the highest potential of speedy growth. He toured to Nishinomiya to visit Hanshin Koshien Stadium where the 86th High School Invitational Tournament is in progress and met officials of Osaka Hanshin Tigers. President Nawier from Indonesia and his party are in Tokyo to introduce themselves as newly elected officials of the Indonesian National Federation to Baseball Federation of Japan as well as Japan Softball Association. In Tokyo, they toured Meiji Jingu Baseball Stadium, the site of demonstration baseball games at the 1964 Tokyo Olympics and a potential venue for baseball and softball at 2020 Tokyo Olympics if these sports are included in the medal games. The Indonesian group will visit Taipei on their way home to meet President Tom Peng of Baseball Federation of Asia on April 1.